There are times when I’ve got so much to do, I’ve got no idea where to start or what the prioritization is. It’s just an overwhelming mess of things that need to be done. I’m frozen in analysis paralysis and stressed out. It’s time to take a deep breath and apply what I know of prioritization to the chaos of all the tasks piled up in front of me. Sometimes, my approach can be straightforward and simple. 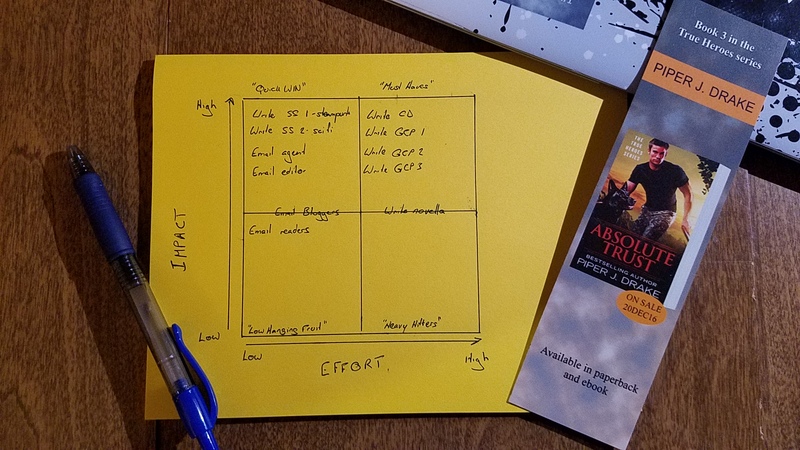 Other times, I need to apply my flexible approach to evaluating and organizing my tasks in a matrix to easily decide what to work on next. Where’s Piper? In her home office! OMG something else hit my To Do list! You can support EMEPiper and Piper’s other writing-related creative content at patreon.com/piperjdrake. Kanban is a method for managing work to be done without overloading the people doing said work. The method is applicable to writers, especially when undertaking complex projects. It allows the author to have a nice overview of what needs to be done while still having it easily organized into do-able tasks. Kanban starts with creating a few basic categories for your work. I divide my process into Triage, Do Today, In Progress (right now), and Done. You can divide your process into categories that resonate with you and match your personal way of doing things. At first, I take each of my tasks and put them in the Triage category. These should be finite, do-able tasks. If I’m drafting, this could be researching a particular detail or writing a specific scene. If I’m revising, this could be addressing a specific revision note like clarifying my order events and timeline or adding more detail to my hero’s backstory. At the beginning of my day’s work session, I pick one or two tasks–no more than three–and put them in the Do Today category. Then when I’m ready to start working, I pick one task and put it in the In Progress category. Then I get to work. This allows me to focus on the task at hand. And maybe I’ll finish it, so it then goes in the Done! category. Or maybe I’ll have worked on it as far as it can go before I finish other tasks, so I’ll leave it in In Progress and take the next task from Do Today. The goal here is to not be overwhelmed by all the things floating in the Triage category. I’ve identified them. I know they’re there. I can even add more. But on a given day, I’m only focusing on the few tasks I’ve placed in Do Today. Because I’m focusing on them, I can get them done. Kanban method can be done on paper. 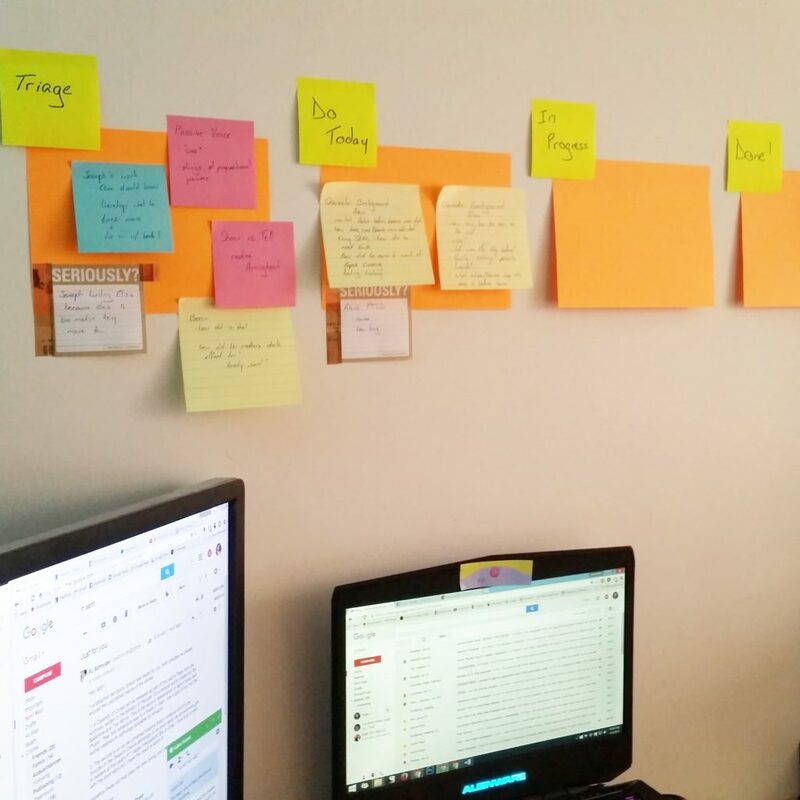 I have big Post-It notes on my workspace wall, actually. Or there are online web apps to let you organize. I use Trello, for example. Using the kanban method to manage my “things to do” is effective to keep myself productive and protect myself from getting overwhelmed. It makes me feel better to have all my random, free-floating to do’s in the Triage category. It let’s me focus on the specific tasks I’ve pulled into my Do Today. It feels really good to drop a task into my Done! category. Does this method interest you? I’d love to see examples of this method applied to other authors’ work.